Having had my two girls, I have packed a hospital bag twice and you definitely learn from the first time what you actually need to pack. A few of my friends who were pregnant after I had Alice asked me, what I put in my hospital bag. I think because I am known to be organised, they knew that I would have a comprehensive list for them to use. In fact I still have my original list from the time I packed my bag the first time…I know, I should probably throw that notebook away! So, here is what I packed in my hospital bag when I was pregnant the second time with Holly. 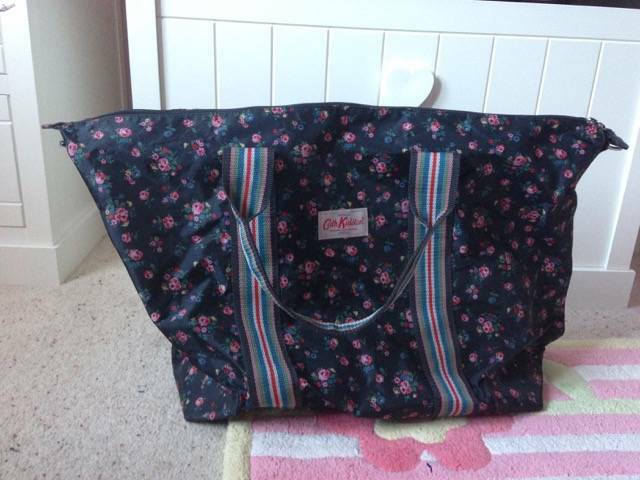 Let’s start with my bag, I used my Cath Kidston Foldaway overnight bag, which was great. It’s a good size and folds away neatly afterwards. I have since used it for holidays to pack the girls clothes in. Slippers – because it was summertime for me, I had flip flop slippers. Snacks of your choice – TIP – include jelly babies for an instant sugar rush, when you are getting tired during labour. Five pairs of big pants – ones that you don’t mind going in the bin. Have about two weeks worth at home. Next, I have my toiletries bag. Thank you 🙂 It is definitely a good idea to be prepared.